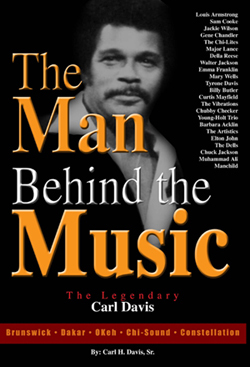 During the golden years of the; 50’s 60’s and 70’s, Carl Davis, was one of Chicago’s hottest music producers and record executives to ever blaze the trails of Chicago’s renowned Record Row. This action packed memoir chronicles his rise to prominence and power in a dazzling yet cut-throat music business where only the strongest survived. Mastering the art of cutting a deal to the artistry of cutting wax, Davis’ visionary leadership helped forge the legendary Chicago-Sound. From the stage of Chicago’s famed Regal Theatre to the bright lights of concert venues throughout the world, his artists were some of the brightest stars of our time. No longer an unsung hero, this autobiography punctuates the tireless efforts and the timeless contributions of one of America’s greatest music producers and record company executives. To many he was a friend, to others a businessman, but to his artists and fans throughout the world – he is and will always be – the man behind the music.